What a mess up front. If you want those details though you can certainly find them in a lot of places. I can give you the cliff notes though. For the cars, Toyota just went face-first into the mud. 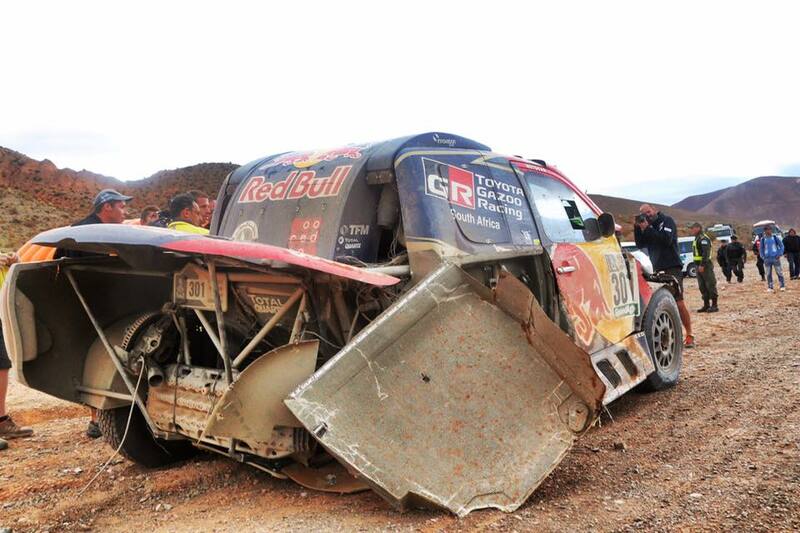 Nasser Al-Attiyah was reported to have “lost a wheel on course.” When pictures came in that actually seemed to be the only part they hadn’t lost. The right-rear was torn away and after strapping the wheel and some stones to the engine for counter-weight, the team limped on, losing about two hours in the process. That leaves Peugeot with all their pieces on the table. Opposition? Nani Roma is a big Dakar name and the only Toyota left in close proximity to the lead. But this is a team sport, and Peugeot having all its cars means they can stop to support each other. Mini is still there too. Remember them? Swept the front of the field for years? Yes, well, rule changes can hurt. Especially if Peugeot is a French car company and Mini is German. For the bikes, the word of the day was navigation. Leader Toby Price traded his lead for 5th place by the time he ended Stage 03. Yes, it happens like that. It isn’t the end, but there are strong riders in front of him now. If he is hoping for a mistake to get him back into the lead, it will take him riding mistake-free for the rest of the rally to make use of such a gift. Meanwhile, 9th place rider Joan Barreda catapulted into the lead plus a handy lead. There is a man who knows how to read a road book. Joan Barreda takes his navigation seriously each night. It helped him in Stage 03. Source: Barreda’s Facebook page. Now, for the Malle Moto. It is as hard to track as always, but it appears the first 70km or so were as bad for the independents as they were for anyone. This area had a lot of offroad and riverbeds, meaning staring at terrain right in front of you in the 100°F (40°C) heat. This threw of some with navigation, some with fitness, and others it just meant tip overs. Lyndon Poskitt seemed to lose the most here in this first waypoint, falling to 71st overall before finishing the stage 60th. Lyndon Poskitt, Stage 03, Dakar Rally 2017. Source: Dakar. While this is a great comeback, it does drop Lyndon from 2nd to 4th in Malle Moto and 51st overall. Not a huge deal this early on. A struggle on one checkpoint… it happens. On the other end of things, I still have found no explanation for the meteoric stage performance of Toomas Triisa. The Estonian finished 37th and jumped in the overall ranking to 36th… a massive improvement in one day. He now leads Malle Moto with a scant 5-minute advantage over second place rider Jose Kozac of Argentina. Lyndon posted a short update via Facebook but mentions little about the navigation errors in CP1. He does mention stopping at the bank to get money and then getting caught in a snow storm. Dakar gives it to you all at once. Stage 04 will be over 400km of special. That means the actual timed part. It’s a huge special. A lot can go wrong. They are at altitude now and there is a serious climb. Today seemed obviously designed to push out competitors who have no business in a rally this complex. Stage 04 seems designed to simply break machines and force out anyone not physically fit enough to go the distance. High altitude, a lot of timed miles, and the first dunes of the rally. It appears the organizers want to break people right away, which actually makes sense. Why have 14 days littered with accidents when you can just make people quit early? The sun will rise. How many machines will be at the start line? 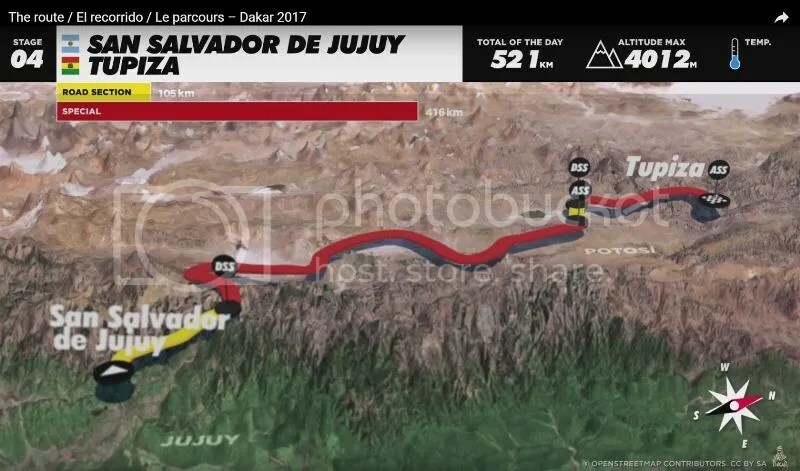 Stage maps provided by Dakar Rally. 3D map courtesy Moto-Myway.